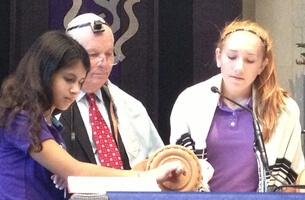 We are honored to have had a special guest with us in 7th grade morning minyan on Monday – Senator Ben Cardin received an aliyah to celebrate his recent reelection to the U.S. Senate. In addition to being one of our U.S. senators, Senator Cardin is also the grandfather of two KSDS students, one of whom is a current 7th grader. We were thrilled to have him join our community for minyan this week, and look forward to having our 7th graders meet with him again on Wednesday when they tour the U.S. Capitol as part of their Social Studies curriculum.